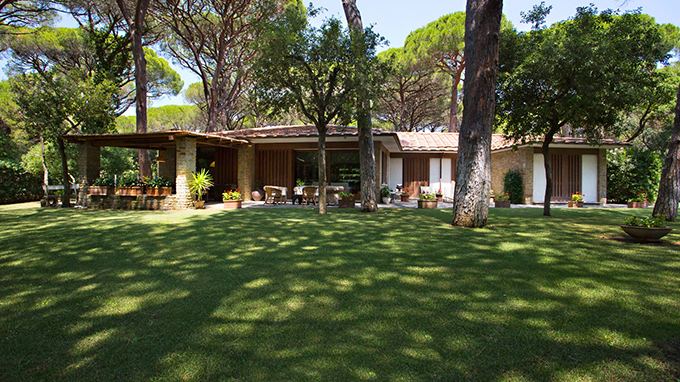 Like many prestigious properties in the area, the villa is surrounded by a shaded lawn with century old pine trees that ward off the heat in the summer days and that is perfectly manicured, providing the villa with privacy and tranquility. This luxury property has an internal surface area of 280 m2 on 2 levels. The ground floor is about 200 m2 and there is also a basement. The exterior is perfectly integrated with the surrounding landscapes. Here there is natural stone and wood that alternate on the large windows, a large loggia perfect for al fresco dining and relaxation. The interior is luminous and finely decorated, and is in constant touch with the exterior which provide this dream home with a relaxing environment where the surrounding nature dominates. There is also stone and wood features in the rooms in the house. The elegant living room on the ground floor is surely one of the homes focal points, with its large panoramic windows that look out onto the garden and with its large fireplace. The 3,000 m2 outside offers the possibility to expand the property and to add a pool amidst nature. This wonderful luxury villa with swimming pool for sale is in the province of Lecce, just a few steps away from Apulia's crystal-blue sea. This villa for sale is in the province of Florence, located in a stunning hilly setting along the so-called "Strada dei Vini Chianti Rufina e Pomino". This villa for sale is in Florence, in an exclusive hilly position with a view over the surroundings and this city's monuments.